This manuscript contains several texts relating directly to Abingdon Abbey, for which it must have been made. These include a cartulary, a list of church officials, a customary (recording details of how various actions should be performed, such as the initial of a novice), a list of lands belonging to the abbey, and so on. 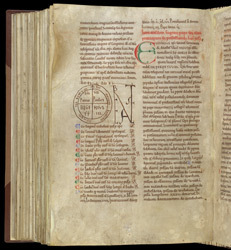 The left-hand column on this page contains the end of a papal bull of Pope Eugene III (1145-1151), followed by his 'rota' (a circle, with his motto around the outside, and the names of Sts. Peter & Paul, and his own name, in the middle) and the monogram made up of the letters of a customary salutation: 'Bene valete'. This is followed by the list of witnesses, the date 1146, and the start of another charter of the same pope.